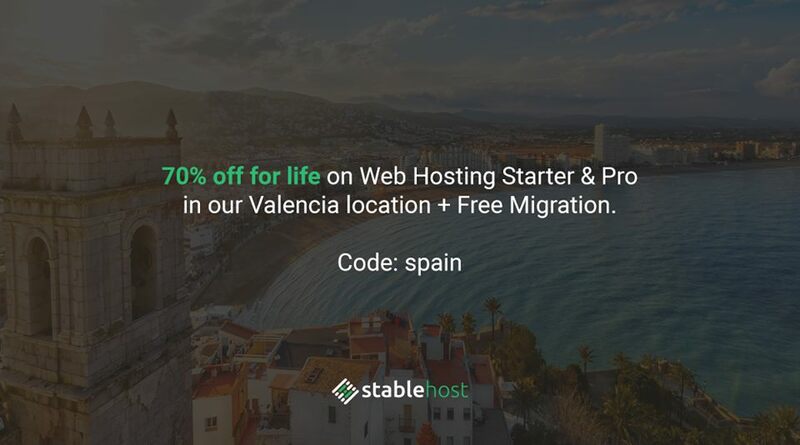 Celebarting the new data center in Spain – Valencia, StableHost is now launching a new coupon code which helps to save 70% off for life. The code is applied for any Starter & Pro Web Hosting in Valencia location. StaleHost also offers free migration to any client that wants to move their current hosting to StableHost. Plus with the Pro web hosting plan, you will get a Free .COM, .NET, .ORG, .BIZ or .INFO Domain. Click to visit StableHost and get the offer. Only for new accounts. No renewals, no upgrades. The code is valid 1 time per person/per account.